Insulated steel base door with durable Ultra Grain® finish. Clear Cypress composite overlays applied to steel base door. An economical alternative to Canyon Ridge® Limited Edition. 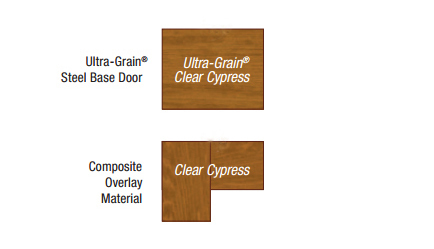 Shown in Medium Finish with Clear Cypress Overlays. See Design Options tab for composite cladding and overlay options (Material Design Options) . Warmer. Quieter. 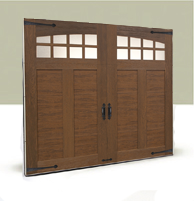 Stronger.Garage doors featuring Intellicore® insulation technology represent the ultimate smart choice for homeowners. Clopay’s Intellicore® is a proprietary polyurethane foam that is injected into a garage door, expanding to fill the entire structure. 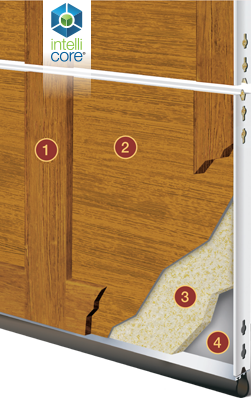 The result is a door with incredible strength and durability. Read More. Illustrations below are shown in the Medium finish. Walnut Finish also available. See below.